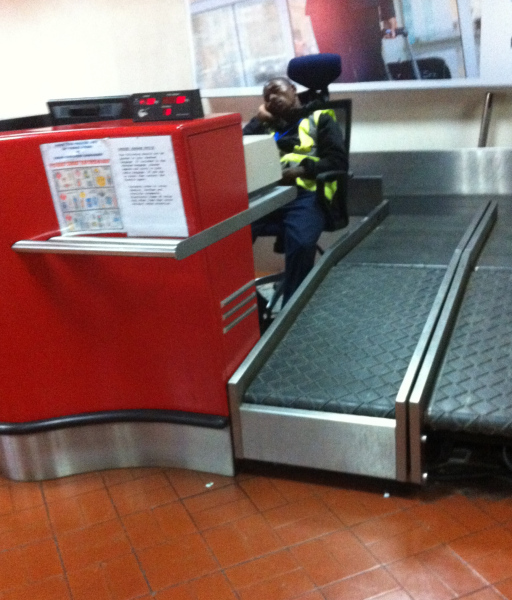 Arriving at the building site that is JKIA, it felt more like we were going to Alcatraz with the barb wired roll top walls. Surprisingly the customs was a lot quicker & efficient than the old airport and I was delighted to see that my Fly540 check in assistant was thoroughly awake to welcome me. He looked how I felt! My first stop was Tusitiri in Lamu. Tusitiri is a stunningly restored old sailing dhow which is run by Lulu and John Clark who have been working on the dhow for 4 years & have been running lodges/camps for over 20 years. John is a qualified safari guide but also a very keen deep sea fisherman & they are perfect hosts – great company but also sensitive to the fact that most guests are keen to do their own thing on board. 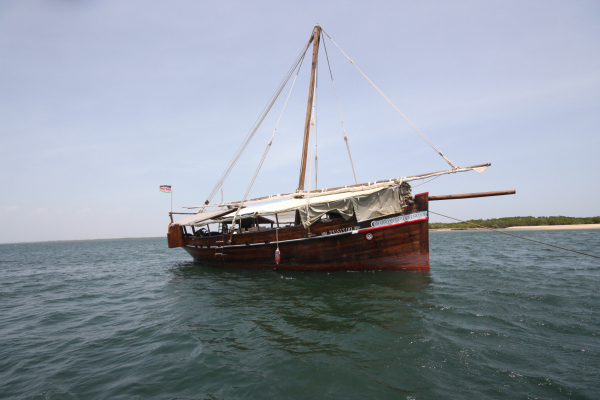 Tusitiri is moored in Lamu Channel just off Shela and has 4 tenders (35 foot fishing boat, two open skifs and a traditional dhow) so guests have the flexibility to go off exploring, go fishing, water skiing whenever they want. The average length of stay on board Tusitiri is 4 days which would be perfect. 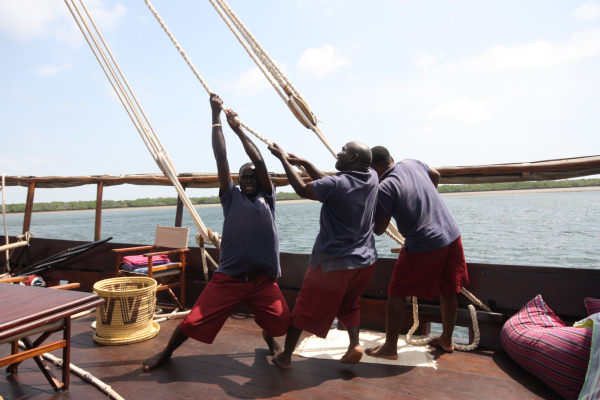 That will allow you one day exploring Lamu & Shela whilst still giving you enough time to go exploring further afield. . Depending on the trade winds. 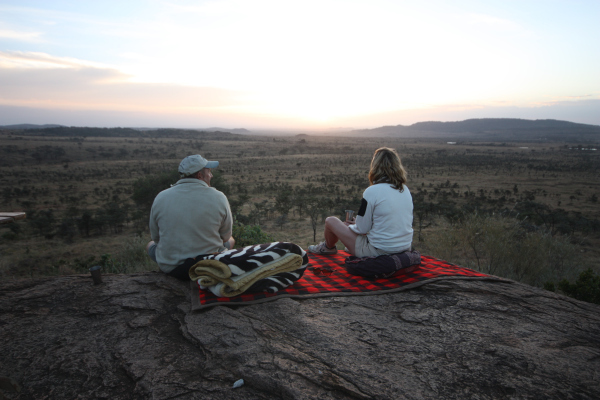 John & Lulu take their guests either down to Kipungani or up to Manda. Feb/March & Oct/Nov is a best time to come to Lamu. Tusitiri can sleep up to 10 people but I think 8 would be the perfect number. Downstairs they have a very neatly designed storage room, loo and dressing room but the majority of the time is spent upstairs on the deck. There is plenty of space & it is very cleverly designed with chill out areas, seating area and dining area. Everyone sleeps up on deck under the stars. I was intrigued & a little apprehensive as to how this might work but it was surprisingly private. The team cleverly create a wall of cushions between each person & divide up the deck so that John & Lulu sleep on the other. Falling asleep under the full moon & stars with the sound of waves lapping against hull was unbelievably relaxing & the perfect way to recover from an overnight flight. Day 2 started with a refreshing swim across to the sand bar off which we were moored. What was supposed to be a relaxing little swim turned into a full on work out when I realised the current was so strong I was going to miss the dhow & end up out to sea! 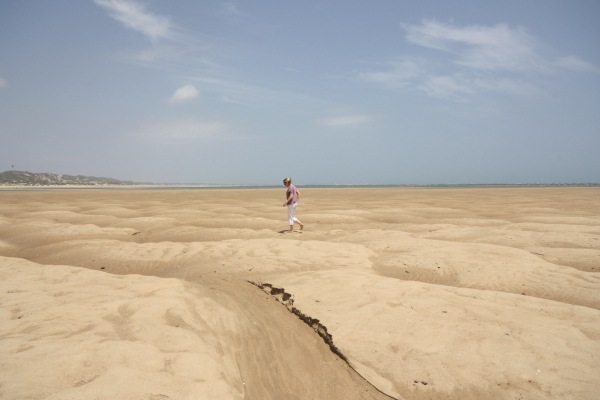 Lulu & I ventured into Lamu which was fascinating. I have travelled extensively around Kenya but never to Lamu & was really amazed by the fact that such a mix of people live so close to each other in relative harmony. 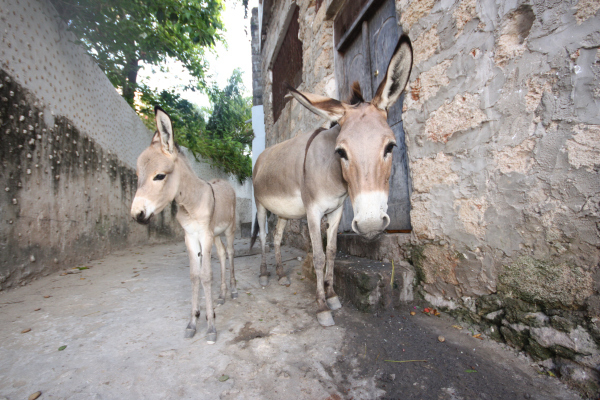 I also couldn’t believe the number of donkeys that you encounter when wandering around the narrow roads. Once back on Tusitiri John decided it was time to show Tusitiri in all its full glory with its sails up. It was then that I realized why they needed 14 staff….! Getting a 1000sq foot sail up manually was a serious operation but once it was up it was an incredible sight to see. There is something truly magical about sailing along on a magnificent vessel whose concept has changed little over hundreds of years. 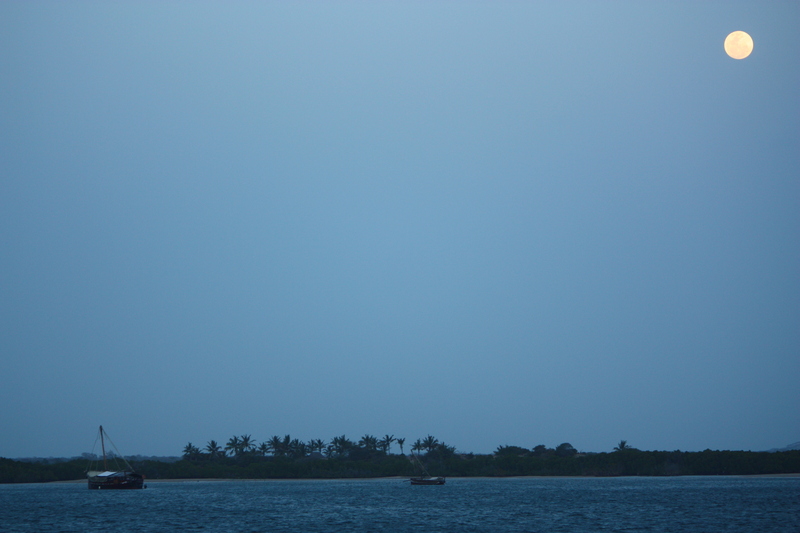 We travelled around the back of Lamu island through the mangrove channel to Kizingoni beach. Tusitiri use Kizingoni beach as a mooring during a 3 day safari and use it as a base to go off exploring, snorkeling, fishing and even on a safari to the Amu Conservancy … www.lamuconservationtrust.org – community owned and run programme which is supported by the David Sheldrick Wildlife Trust. A delicious lunch of fresh crab caught that morning was the perfect send off for my 24 hours in Lamu. Tusitiri is perfect for groups or families who want a really unique adventure and have a sense of fun. I felt very privileged to have experienced such a stunning, huge vessel which is so traditional and which hasn’t changed for centuries. 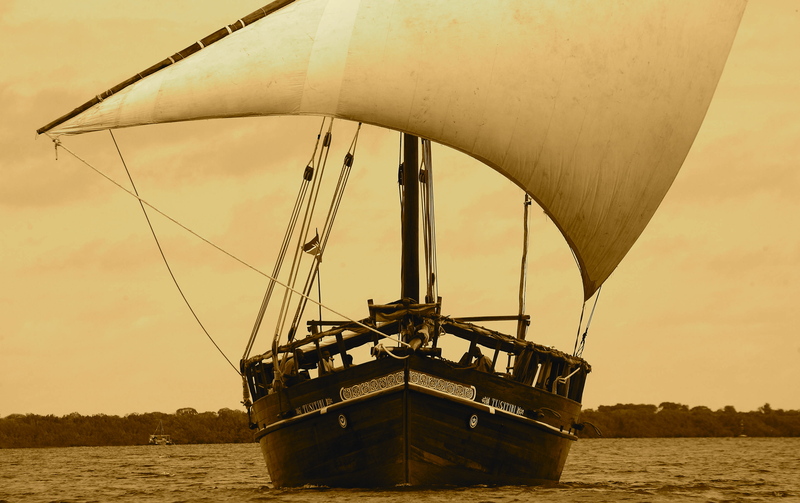 Tusitiri really is a work of art and with her Zanzibari antiques, Swahili textiles and incredible seafood few on-board experiences can replicate the historical tradition of boat travel as beautifully. There was quite a welcoming committee out to greet me at Enasoit. 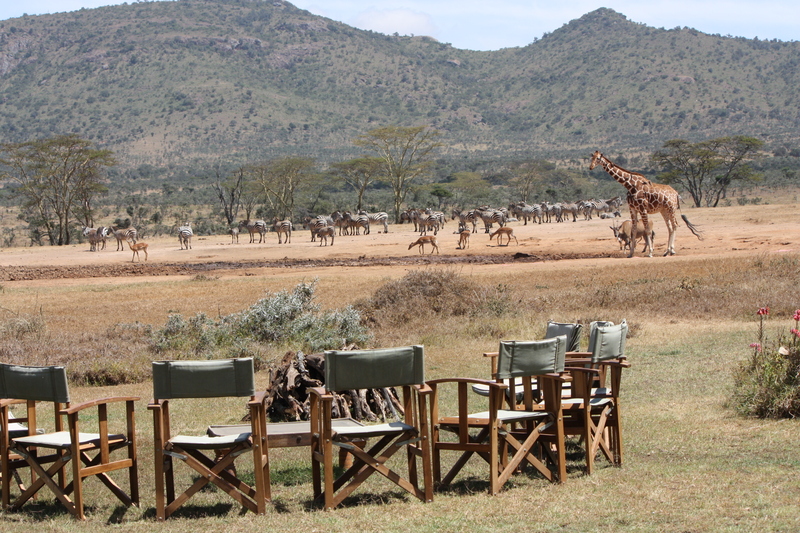 Over 100 animals were taking their mid-day refreshment at the watering hole in front of the camp. I almost felt like I was watching a film rather than real life as the view was so unbelieveable! Mabel their pet Ostrich was also keen to meet the new guest. 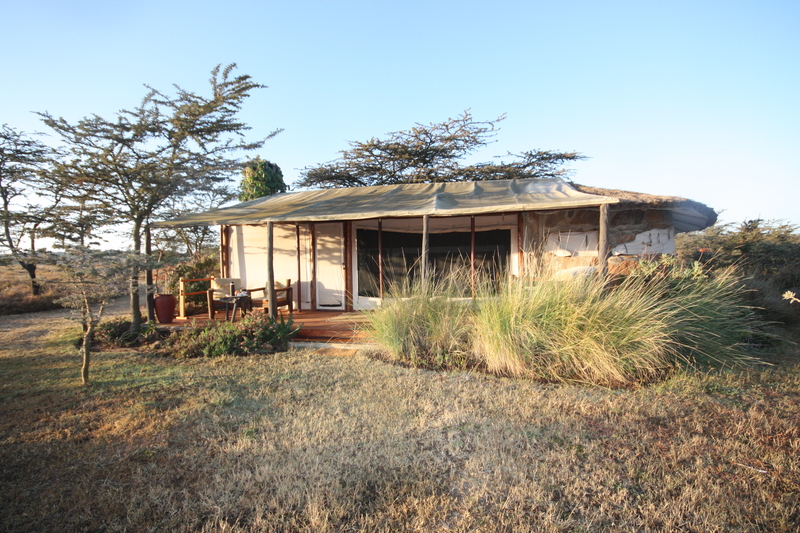 Both Tusitiri and Enasoit are owned by a Norwegian family and until very recently Enasoit was their Kenyan home. It has an understated elegance which makes you feel very at home. Their interiors are very stylish but designed for a family rather than having the staged interiors of a property designed for tourists. Peter & Karen Glover are the managers at Enasoit and are the perfect combination of being great fun, excellent raconteurs and very welcoming making you feel at ease immediately. It seems that they have become part of the family and they make you feel the same. As Enasoit is only available on an exclusive use, it means that the guests can choose excactly what they want to do when. 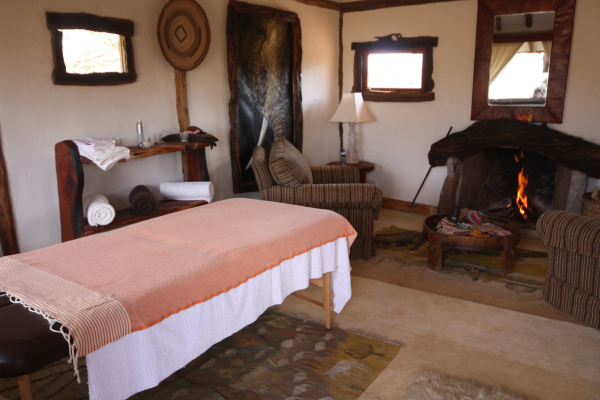 The ranch itself is 4500 acres but they also have traversing rights to go onto the two neighbouring ranches as well so there are limitless options for exploring. 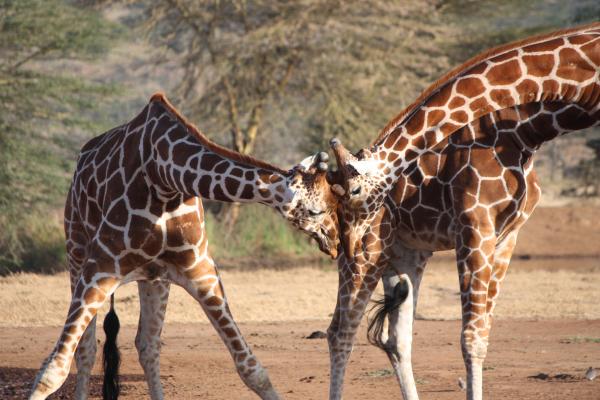 I would have been quite happy to sit & enjoy the game water hole all afternoonbut I had the ardous task of experiencing the most heavenly massage by their beautician…..sometimes this job is so hard! 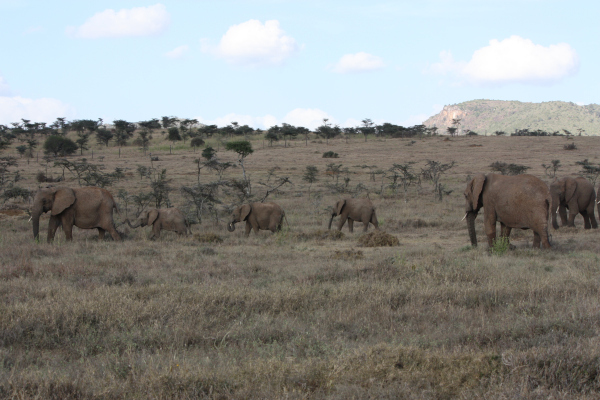 After my massage we ventured out on a game drive and quickly encountered a herd of over 30 elephants. 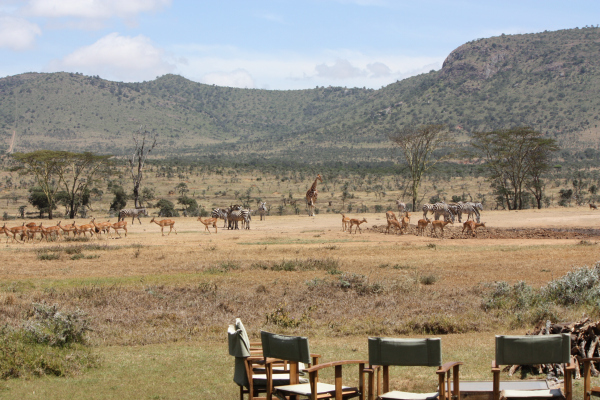 We were treated to lots of other game including Oryx, giraffe, Zebra before enjoying some sundowners overlooking the ranch. 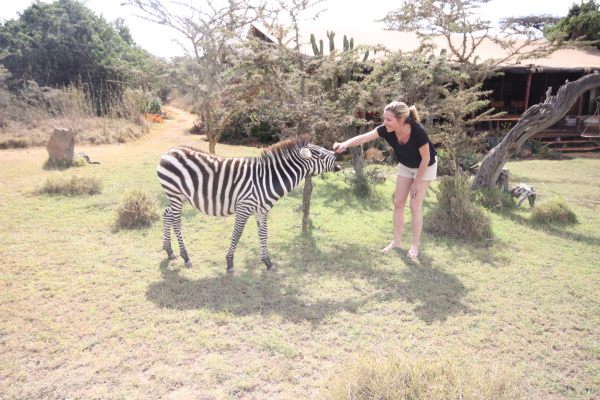 Before I left the next morning, I had the great priviledge of meeting another of Enasoit’s colourful pets….Ziggy the Zebra. Yes I even matched my outfit to hers! Enasoit is asbolutely ideal for a large group looking for complete privacy and flexibility. 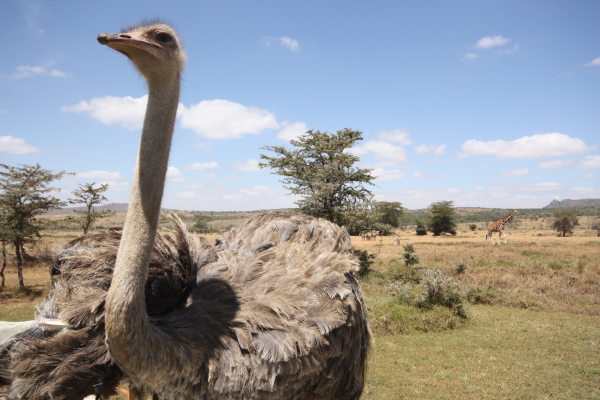 You can choose exactly what you would like to do when there and the game is so prolific around the main mess area that there is almost no need to go on game drives! 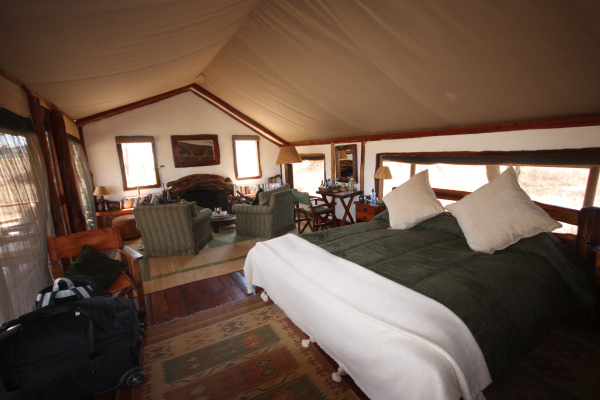 This would be a perfect place to come with young children who maybe don’t have the ability to sit for hours in safari vehicles as through the Enasoit pets and the game surrounding them they can experience so much at the main lodge without even getting in a car. 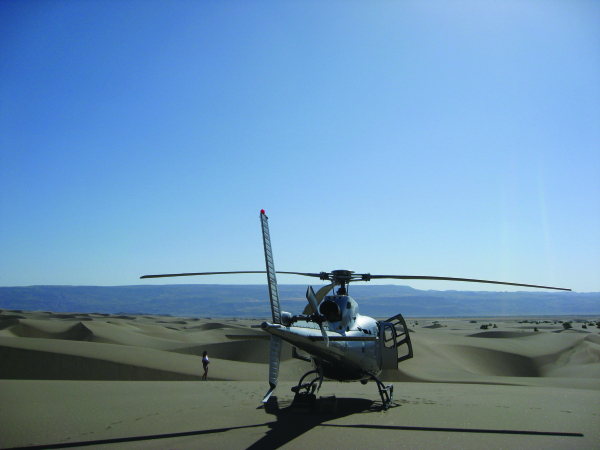 However for those who are keen to venture further afield they can charter the owner’s helicopter to explore Mt Kenya or Northern Kenya…..maybe next time I’ll be lucky enough to experience this! !